Obverse: Cojoined busts of Aretas laur., and Queen Shaqilath, dr.; Aramaic letters in field. 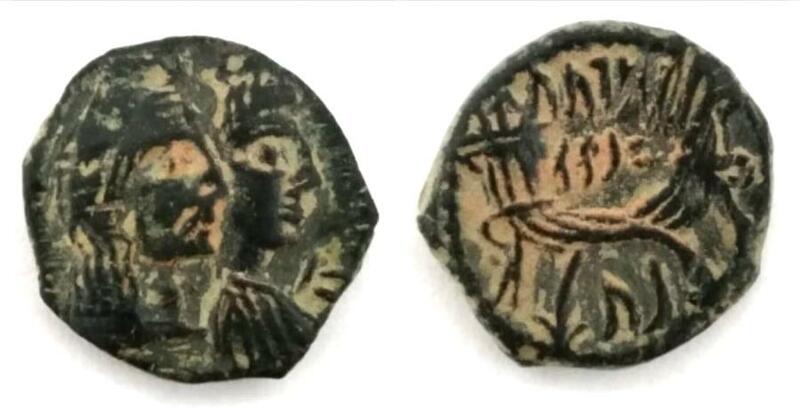 Reverse: Two cornucopiae, crossed; between them, Aramaic legend (Aretas, Shaqilath) in three lines desert patina. (4.5 g - 18.3 mm). Good very fine. AS FOUND: NABATAEAN KINGDOM.BEAUTIFUL ARETAS IV & SHAQUILAT AE. GOOD VF.well centered example.